As part of our Sewing Summit class, Faith and I are asking participants to precut their fabric in order to save time in the class. To make sure everyone has ample opportunity to do so here is a quick tutorial on cutting diamonds. Diamonds are simple to cut with a standard ruler. Don't forget to save the pieces that are not full diamonds. 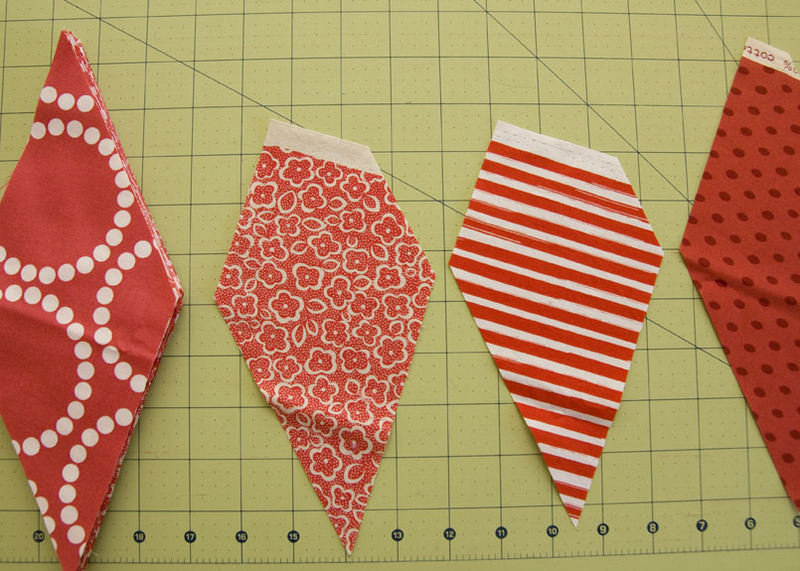 These can be used on the top or bottom of a quilt layout. 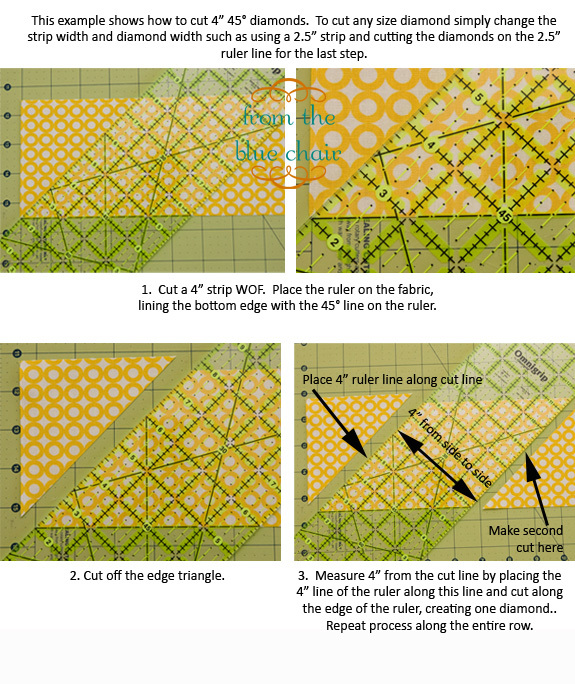 **For those attending Sewing Summit: If you plan to make the practice block shown in Google Group you will need to cut 2.75" 45 degree diamonds. You will need 8 of fabric A, 3 of fabric B and 18 of a white solid. If you just want practice and don't plan to make the block, you can cut your diamonds any size. I recommend cutting about 25 for practice. Oh man, I'm hoping I can get this done on the Thursday night before the class, wish me luck! Yay! where do i find the tute for cutting the hexies? Thank you so much for this post. I want to let you know that I posted a link to your blog in Creative Busy Bee Craft Inspirations, under the Page 4 post on Sep. 18, 2012. Thanks again. Sorry if I've missed or am missing something, but instruction 3 here confused me. You said " cut 4" from the diagonal line". By diagonal line, i took it to mean the cut line, but measuring 4" (or in Sewing Summit peeps case, 2.75") from there doesn't work, or didn't for me. I had to invoke a little Pythagorus to get the sides even. Isn't the actual measurement square root of 2 x 4" (or whatever the width is supposed to be - in our case, 2.75") from the diagonal??? Or in other words, the diagonal across a 1" square rather than 1"?